You will be evaluated prior to the service to ensure you are a good candidate and to help manage your expectations. The treatment itself takes only 10-15, and is virtually painless. Most of our clients go back to their regular day to day duties right after the treatment is performed. For optimal results, we typically recommend 3 treatments every 4 weeks. After the 3 treatments are given, results can be maintained with 1 treatment per year. 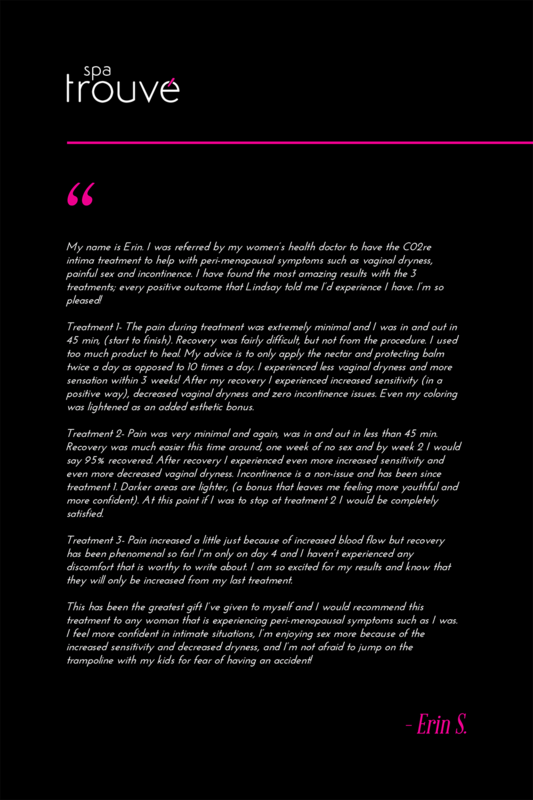 We highly recommend download our Patient FAQ form for more detailed information on this life-changing service. For more information about vaginal rejuvenation treatments check out our flier here » or call us today!